This is one amazing drink. It's very different. It's sweet. It's nutty. It's floral. It's fruity. It's heady with the fragrance and flavor of cardamom (if you like cardamom this is the drink for you). The most interesting component, and what gives the drink it's pink color and floral flavor is Rooh Afza Syrup. I remember the weather was warm and I was attracted to the gorgeous label that says "Summer Drink of the East". The label describes it as "a soothing cooling and thirst satisfying beverage base syrup". It says the syrup is to be mixed with ice-cold water or with milk and ice cubes for a pleasant drink. I bought the syrup and then found this Sharbat recipe to use it in. This recipe can easily be doubled. Roast the nuts. When cool crush finely. Crush cardamom pods (you may need up to 2 tablespoons). Extract seeds until you have 1/4 tsp. Grind them in a mortar and pestle as finely as you can. 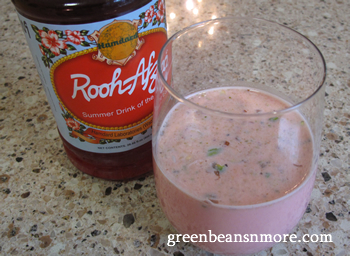 Mix together the Rooh Afza syrup, sugar, vanilla and cardamom into the milk. Mix well. Taste. Adjust sugar to your liking. Add 1/2 nuts. Refrigerate overnight. Mix well before serving and add sprinkling of remaining nuts on top. To roast nuts: Spread the nuts evenly on a baking sheet. Place them into a preheated 350° F oven. Stir occasionally until the nuts are fragrant and lightly browned (5-10 minutes). The nuts will continue to cook if left on the hot baking sheet so quickly put them on a plate to cool. Combine in shaker over a few ice cubes. Shake thoroughly. Pour into glass. Combine all ingredients in a blender. Blend well. Pour into glass.